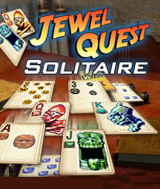 Jewel Quest Solitaire allows you to play Tripeaks Solitaire in a new way using jewel-themed decks. Match card suits to earn pieces for the jewel quest board then turn the jewel quest board´s spaces to gold. Unearth buried cards, avoid cursed jewels, and solve the 114 card layouts on a South American jungle trek. Experience 684 possible card scenarios through an exciting new Jewel Quest story. Comments: GREAT GAME TO PLAY. LOVE PLAYING THIS GAME.